Mexico’s main regulatory body for medical cannabis revoked key guidelines used as the basis for issuing dozens of import licenses for low-THC products, putting the status of those permits into question, pending a government review. Toward the end of President Enrique Peña Nieto’s term last fall, Mexico’s Federal Commission for the Protection Against Sanitary Risks (COFEPRIS) granted dozens of import permits for different types of low-THC products. On Wednesday, COFEPRIS revoked those guidelines, which had been published Oct. 30, 2018, saying they contravene the decree that allowed for medical cannabis in the country. Current authorities will review the validity of the “supposed authorizations” granted by the previous government. Allowed cannabis for nonmedical and scientific uses. Contravened customs tariff regulations because they did not have the approval of the Foreign Trade Commission. Were not published in the Official Journal of the Federation. Were not presented to the Regulatory Burden Reduction Program. Since the initial round of permits were issued in November, the agency had approved 19 more. Canada’s Aurora Cannabis was one of the international companies that rushed in to sign a letter of intent to acquire Farmacias Magistrales, one of the first permit holders. Heather MacGregor, Aurora’s director of communications, said the Alberta company remains confident about its entry to the Mexican medical cannabis sector. “We continue to monitor the regulatory environment there, and remain committed to working closely with our international partners to help provide safe and unfettered access to medical cannabis products in Mexico and around the world,” she said. Few, if any, of the 57 authorized products were actually imported into Mexico, as the permits were almost immediately challenged by Mexico’s president of the foreign trade commission. According to Mexico’s economy secretariat – the national authority that oversees import and export restrictions – the permits were improperly granted and, thus, imports would not be authorized. July 2017: Decree modifies the General Health Law allowing medical cannabis. To date, the decree has not been regulated or properly implemented. Oct. 30, 2018: COFEPRIS issues guidelines to apply for import permits, just one month before the change of government. Nov. 6, 2018: A bill is introduced in Parliament to legalize cannabis in all forms. Nov. 21, 2018: COFEPRIS issues first 38 import permits. Nov. 28, 2018: Mexico’s foreign trade commission president warns that COFEPRIS permits aren’t valid and imports won’t be allowed. Nov. 30, 2018: COFEPRIS issues 19 additional import permits. Dec. 1, 2018: Change of government. Dec. 3, 2018: Khiron announces receipt of a permit to “import and commercialize” three products in Mexico. Dec. 10, 2018: Aurora issues a news release announcing a letter of intent to acquire one of the permit holders. Dec. 18, 2018: The new government freezes import permits, halting new applications. March 27, 2019: COFEPRIS’ previous guidelines are revoked by the current authorities, calling into question the validity of previously granted permits. In the meantime, a bill is being discussed in Mexico’s Parliament that would legalize cannabis in all forms. In a Senate forum this month, the government body said “legalization is imminent,” with medical and scientific uses expected to be regulated by October 2019. 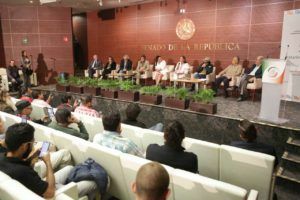 The forum was led by Senator Jesusa Rodriguez, who replaced former Senator Olga Sanchez Cordero when the latter assumed the role of secretary of the interior in Mexico in December. Cordero introduced the legalization bill last November. Sign up for our weekly international cannabis business newsletter below.